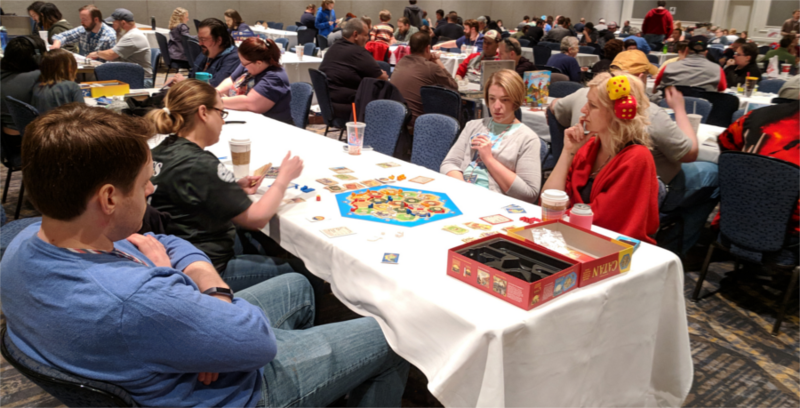 This past weekend at Tennessee Game Days, our final four players faced off to be crowned the champ of the Game Point Catan National Championship Qualifier. The board was tight and the game was close with multiple players near victory up until the very end. When the dust settled, after three preliminary rounds, and a semifinal round, Justin Hornkohl (pictured far left) was the winner. He will go on to represent us at the Origins Game Fair this summer and hopefully bring home a national title. Good Luck Justin!